Gluten-free biscuits are a delightful and healthy addition to meals at breakfast, lunch, and dinner. Whether served as a sweet treat or a hearty side, biscuits are a homemade classic. However, for those on a gluten-free diet, adding a side of biscuits to a meal can be a challenging task. Pre-made and box mix gluten-free biscuits are available at select grocery stores, but the selection is limited and the price is usually high. Thankfully, this list of the 50 most incredible gluten-free biscuit recipes is here to help. From a traditional buttermilk biscuit, to the most unique interpretations of a biscuit, you are sure to find at least one new favorite gluten-free biscuit on this list! For those craving the incredible taste and doughy texture of pull-apart dinner rolls, look no further than this gluten-free biscuit recipe. Although each roll is placed in the pan separately, the rising and baking process is what helps form the biscuits together in to one single pull-apart bread. This gluten-free biscuit recipe is an easy one to make, and has a reasonable ingredient list. Since this recipe yields nine pull-apart dinner rolls, it is great to make for family gatherings. For an extra hungry or larger crowd, make multiple batches of these gluten-free pull-apart dinner rolls. Planning a gluten-free Italian night in the near future? Instead of a standard garlic bread, try something a little different. Whether serving spaghetti, lasagna, or another favorite gluten-free meal, these parmesan rolls are a fantastic addition to your next meal. Tapioca starch is recommended for use as the primary dry ingredient. However, a gluten-free flour can be used in place of the tapioca starch if desired. Parmesan cheese is added directly in to the dough, making every bite full of cheesy goodness. An optional blend of flavorful additions (such as cayenne and scallions) can also be used. While there are several gluten-free buttermilk biscuit recipes on this list, this recipe names itself as the “perfect” gluten-free buttermilk biscuit recipe. We can absolutely confirm that these biscuits definitely live up to their title. Uncomplicated ingredients, simple and quick to make, and an unbelievably soft texture are just a few factors that make these biscuits worthy of a “perfect” designation. It is difficult to tell the difference between this gluten-free recipe and a standard biscuit recipe. Try serving these delicious biscuits with a homemade sausage gravy as a filling breakfast and an unbeatable pairing. Who doesn’t love an incredibly quick and easy gluten-free bread recipe? This gluten-free “bread in a cup in seconds” recipe is as fast and simple as recipes can get. All ingredients are added to a microwave safe coffee cup or measuring cup (which ever option works better for you), mixed together, and placed in the microwave for 85 seconds (possibly more or less). Once the time is up, the bread that this recipe yields is similar to that of a biscuit. Divide in to individual slices, and enjoy with your favorite topping. As its name suggests, a generous portion of baking powder is used to make these biscuits. Baking powder helps give each biscuit wonderful lift while baking. This helps create airy, flaky layers. It is almost impossible to know that the finished biscuits are indeed gluten-free, since they closely mimic the texture of biscuits that are not gluten-free. This recipe is not only gluten-free, but also vegan and yeast-free. Tip: Short of meal ideas for this week? Use these biscuits for your next breakfast, lunch, or dinner. Biscuits can be used to create numerous appetizing meals. If you are in search of a simple biscuit recipe, this one is a fantastic choice. Using gluten-free all-purpose flour, xanthan gum, and baking powder as the primary dry ingredients, these biscuits are perfect for those who do not enjoy blending a list of flours. Prep and bake time are minimal, so this gluten-free recipe is great if you need biscuits quickly. Tip: If you enjoy having biscuits regularly, but you don’t love the idea of spending all of your time in the kitchen, make multiple batches. They can be stored in the freezer for later use. This recipe is a slightly easier version of a cheese garlic biscuit. Rather than blending various flours, the primary dry ingredient is gluten-free Bisquick mix. This helps save a significant amount of time, making the total prep and bake time about 15 minutes. The baked and cooled biscuits would be good enough to eat on their own. Making an incredible recipe even better, a garlic butter sauce adorns the top of every exceptional biscuit. Each batch makes 10 biscuits. This is another great recipe to make an extra batch (or two) to freeze for later. When most people think of biscuits, they think of the plain variety that requires an added topping. However, biscuits are so much more versatile and exciting than the standard biscuit recipe. These ham and cheese biscuits are proof of this statement. Functioning as more of an appetizer than a true biscuit, these biscuits are loaded with incredible, savory ingredients. Cheddar cheese, ham, and green onions add rich, incredible flavor to every bite. To make these fabulous biscuits even better, the variety in textures work well together, creating another biscuit that you wouldn’t guess is gluten-free. For those on a gluten-free diet and paleo diet, it can be nearly impossible to find a good biscuit recipe. Thankfully, this recipe produces marvelous biscuits that are suitable for both diets. To create the biscuits, a precise blend of flours are blended together as the dry ingredients. Tapioca flour, almond flour, and coconut flour are used in addition to cream of tartar and baking soda. This combination helps create the sturdy build of each biscuit. Tip: As a meal idea, try using these biscuits to create a gluten-free and paleo breakfast sandwich. Adding a nutritious twist to a standard biscuit, these gluten-free sweet potato biscuits are a versatile template for many meal ideas. Almond and white rice flours are the gluten-free flours used to create the biscuits. This easy recipe yields soft, dense, and highly flavorful biscuits that are sure to please. As stated before, these biscuits can be used with a wide variety of toppings. A preferred way to serve these gluten-free sweet potato biscuits is with butter and honey. They are especially fitting when served as a seasonal side dish for your next holiday celebration. Featuring both a crisp exterior and a soft, cloud-like inside, perfection is achieved with this classic biscuit recipe. Despite having a slightly larger than normal ingredient list, the extra effort is well worth it. So, what exactly makes this one of the best gluten-free biscuit recipes around? The calculated use of a specific set of ingredients (especially when it comes to the dry ingredients) is what sets these biscuits apart from the rest. Tip: Serve these biscuits with wholesome, simple ingredients (such as butter or jam) to bring out their incredible flavor and unmatched texture. Cheesy biscuits are a much-loved favorite of many. However, they are not typically thought of as being healthy. That is, they haven’t been considered healthy until this gluten-free recipe was created. These cheesy cauliflower biscuits are made with wholesome ingredients, and contain no flour. Instead, what helps these biscuits take shape is mashed cauliflower. Cauliflower has become a popular substitute for crusts, tortillas, and other foods that contain flour. When the cauliflower is blended with the other wholesome foods on the ingredient list, they knit together a convincing biscuit. Enjoy as a side or a snack. Making for an irresistible breakfast or snack, these gluten-free orange cranberry oatmeal biscuits are an exciting treat. Instead of using gluten-free flour, this recipe uses dry ingredients such as oats, chia seeds, and baking soda. Absolutely no flour is used to make these biscuits. Giving the biscuits their fantastic taste are ingredients such as cinnamon, almonds, orange zest, dried cranberries, and more. In addition to being gluten-free diet friendly, these biscuits are also vegan. The recipe yields 12 biscuits, takes about 50 minutes to prep and bake, and can be enjoyed throughout the day. Those who are looking for a little bit more of an adventurous biscuit idea can get excited about these pumpkin, bacon, and chive biscuits. Aside from having a creative combination of flavors, these biscuits are both gluten-free diet and paleo diet friendly. Each biscuit is made with bacon pieces, pumpkin puree, and finely chopped chives (green onions are a perfectly acceptable substitute for the chives). This gluten-free biscuit recipe is incredible to use as a side to a favorite gluten-free food. Also, try serving these pumpkin, bacon & chive biscuits as an appetizer. Starting your day with a mouthwatering breakfast is definitely a preferred way to begin the day. Prepare these gluten-free white cheddar sausage breakfast biscuits and enjoy alongside other gluten-free foods at breakfast. What makes these biscuits unique is the distinct blend of flavors used in the biscuit dough. Garlic, chives, sea salt, and Italian seasoning all work together to reveal an amazing flavor profile. The sausage and sharp white cheddar cheese work with each of the spices to create an unforgettable gluten-free breakfast biscuit experience. This gluten-free recipe is low-carb and yields eight biscuits. Adding an exciting burst of flavor to the standard biscuit, these gluten-free cheddar biscuits are an awesome addition to the dinner table. Each roll is soft on the inside, crisp on the outside, and full of cheesy sharp cheddar goodness. Making an incredible biscuit even better, the recipe also includes instructions for a garlic butter topping. The marvelous taste created by this gluten-free recipe easily makes it a top contender for one of the best biscuit recipes you will find online. Each batch yields 16 biscuits, and takes about 30 minutes total to prepare and bake. It is hard not to completely adore the taste and texture of a sweet, warm, and flaky biscuit. These cinnamon bun style gluten-free biscuits are no exception. A generous coating of cinnamon sugar adorns the tops of each scrumptious biscuit. An impressive feature of these biscuits are the many layers found in every one. While this recipe will require a little more work in the kitchen than a standard biscuit, you will be delighted with the finished product. You can indulge in these cinnamon bun style biscuits for breakfast, dessert, or as a snack. While it is fun to make and eat biscuits with creative ingredients, sometimes you just need to have a simple, old-fashioned buttermilk biscuit. It is hard to match the comfort brought by a classic, homemade favorite. These gluten-free southern buttermilk biscuits are some of the best gluten-free buttermilk biscuits around. If you enjoy an easy recipe with minimal time spent in the kitchen, this are a fantastic recipe to try. Southern buttermilk biscuits are best served as either a side dish to favorite homemade gluten-free foods, or when making biscuits and gravy as a main meal. It is hard to find an easy recipe that is this incredibly effortless. With two main ingredients (plain Greek yogurt and gluten-free flour), and salt for added taste, these biscuits require almost no work. Despite the simplicity, there is no compromise on taste. The Greek yogurt creates a distinct flavor that is unlike most other classic biscuits. Many gluten-free biscuit recipes can be involved due to the number of ingredients required. Now with this recipe, those on a gluten-free diet can get excited to spend minimal time in the kitchen preparing these delicious yogurt biscuits. This biscuit idea takes the standard cheddar biscuit and pushes it to the next level of deliciousness. Two flours are used to construct the biscuits (almond flour and coconut flour). Standard shredded cheddar cheese is used as the cheese of choice. What makes these biscuits truly special is the use of garlic and chopped fresh sage. The blend of these strong, yet pleasant flavors make these gluten-free cheddar biscuits one-of-a-kind. When you want a little more than a normal cheddar biscuit, this is a wonderful option. Serve this gluten-free biscuit recipe for your next dinner party. Want to try a gluten-free biscuit recipe that will easily be an instant favorite? These creative sweet potato bacon biscuits are a fantastic break from the norm. The use of herbs and spices such as garlic, black pepper, and fresh rosemary give these rolls and unmatched aroma. The decadence of the chopped bacon, bacon fat, and sweet potato crafts an exquisite flavor. The shape of the completed biscuits is irregular and thinner than a classic biscuit. However, the unique shape has little impact on the overall texture. These flavorful delicacies are also paleo diet friendly. As another one of the best biscuit recipes for those who love an uncomplicated side of bread with their favorite gluten-free foods, this delicious recipe is sure to please. While the recipe formally refers to the bread as a dinner roll, this bread could easily be considered more of a biscuit for its shape and texture. Rather than having a light golden top as many traditional biscuits have, this bread has a deeper golden color. The specific blend of flours used (including sorghum flour, millet flour, hazelnut flour, and others) gives each biscuit a cloud-like texture. Light, fluffy, and flavorful are the best adjectives to describe this simple gluten-free biscuit recipe. With only six ingredients, and minimal work involved, this is the best biscuit recipe for those who enjoy easy recipes. When fully baked, each gluten-free biscuit should have a light appearance, with only a slight bit of golden brown color. 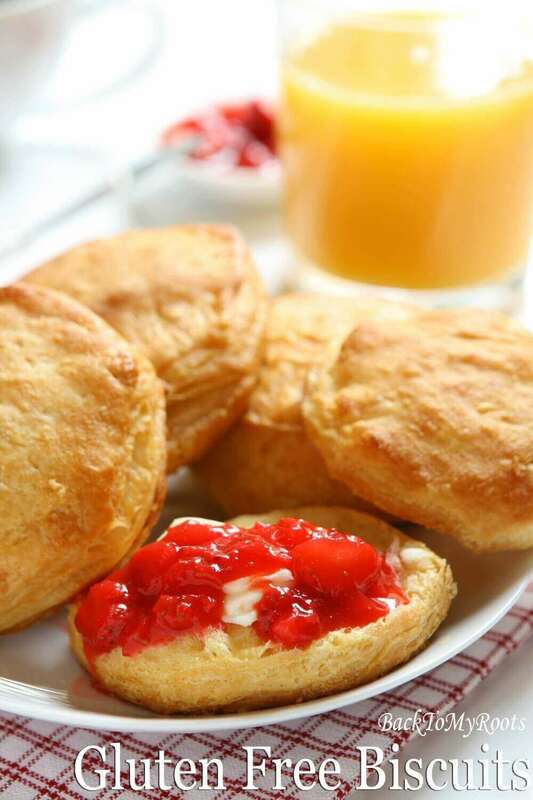 Serve the biscuits with your favorite topping (such as jam, butter, or honey) for a fantastic gluten-free breakfast or a lovely afternoon snack. Feel free to freeze any leftover biscuits for later enjoyment. This recipe yields a total of 12 biscuits. 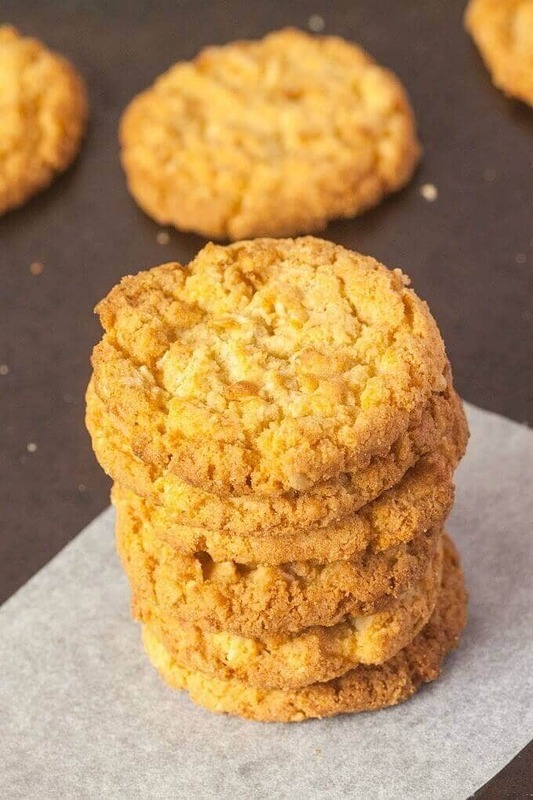 These gluten-free Anzac biscuits are easily the most unique recipe on this list of the best biscuit recipes. They are a classic Australian treat, and are more of a cookie than what is considered to be a biscuit in the United States. They are made using oats, coconut, and several other simple ingredients. Adding a healthy twist to this recipe, the biscuits are made with sugar-free sweetener, making this an excellent choice for individuals needing to reduce their sugar consumption. Coconut oil can be used in place of the butter to make this biscuit idea vegan. Cheddar biscuits were once not widely available for those on a gluten-free diet. Thankfully, that is no longer the case. If you quickly search the internet for gluten-free cheddar biscuits, you will find dozens of individual recipes. Next time you are looking to make gluten-free cheddar biscuits, be aware that this recipe is one of the best you will find. Classic cheddar biscuit ingredients are added to gluten-free flours, making this a stunning addition to your next meal. If you also need to be soy-free and/or dairy-free, there are suggested modifications to fit your needs. If you are looking for a gluten-free buttermilk biscuit recipe that yields incredibly fluffy biscuits, you have found it right here! You have also found one of the most simple and quick gluten-free buttermilk biscuit recipes in existence. With five ingredients (buttermilk, butter, baking powder, xanthan gum, DIY Bisquick Mix), and just under 15 minutes, you can have perfectly soft gluten-free biscuits at your table. Each batch yields approximately 24 biscuits, which makes this an excellent recipe to use for large gatherings. The versatility of these biscuits make them a perfect option for any meal. Almond flour is the sole gluten-free flour used for this biscuit recipe. With all of the health benefits associated with almond flour, these biscuits are one of the more nutritious options available. Almonds contain nutrients such as vitamin E, protein, omega-3 essential fatty acids, and more. In addition to the almond flour, all remaining ingredients are wholesome and natural. A beautiful blend of honey, milk, butter, and cinnamon give the biscuits a pure, light flavor. Those who are looking for a healthy choice will love these biscuits. This recipe makes a total of six gluten-free biscuits. For those who love tasty homemade biscuits, but need to eat a low carb diet, will be thrilled about this exciting recipe. These scrumptious cheesy herb biscuits are both gluten-free and low carb. The biscuits are made using a combination of coconut flour and almond flour, as well as a fun blend of spices. The finished biscuits are perfectly crisp on the outside, and soft on the inside. Tip: Go beyond using these biscuits as a simple side dish. Slice biscuits in half and use as sandwich bread. Make your own creation! If you prefer to make only the most healthy biscuit ideas, then these cauliflower biscuits will be at the top of your list. Made using no flour, these biscuits are wonderful to make when trying to avoid gluten and keep costs down. Aside from the cauliflower, the biscuits use only four other ingredients (eggs, nutritional yeast, almond meal, and garlic salt). While the texture is not identical to that of a biscuit made from flour, they still have a satisfying combination of softness and crunch. As a meal idea, serve these biscuits on the side of breakfast. Nearly all of the other cheddar biscuits featured on this list use real cheddar cheese. There have not been many great options for vegans. Thankfully, one of the best biscuit recipes on this list is a vegan and gluten-free version of a cheddar biscuit. Instead of using milk-based cheese, non-dairy shredded cheese is used. Additionally, non-dairy milk and vegan butter are also used as substitutes. The finished gluten-free and vegan biscuits are fabulously fluffy and delicious. One batch takes approximately 15 minutes to prepare and 15 minutes to bake, and yields eight stunningly perfect biscuits. Even with a traditional variety, no two biscuit ideas are ever truly the same. These gluten-free drop biscuits prove this statement with an ingredient list that is fairly different from the rest. The dry ingredients used in this recipe include almond flour, potato starch, baking soda, and baking powder. While most of the moist ingredients are identical to those used in other classic biscuit recipes, a small amount of vinegar is used in this drop biscuit recipe. These wonderful biscuits are best used as a side to your favorite gluten-free foods, or as a breakfast item. When looking for an easy recipe that is also paleo and gluten-free, these perfect paleo biscuits are an exceptional choice. A wonderfully minimal ingredient list (six ingredients, to be exact) helps to construct nine sturdy, yet cloud-like biscuits. As with most paleo biscuits, the substitute flours used are almond and coconut flour. One use for these biscuits (and a wonderful meal idea for any time of day) is to make sandwiches. Create your own new healthy breakfast sandwich, or enjoy a flavorful sandwich for lunch or dinner. These biscuits are sure to be a favorite. Designed as a gluten-free copycat recipe to replicate the cheddar bay biscuits made famous by the Red Lobster restaurant chain, these gluten-free cheddar bay biscuits are an amazing interpretation. An ample amount of familiar flavors (sharp cheddar cheese, garlic butter, and fresh flat-leaf parsley) closely mimic the extremely popular restaurant biscuits. The recipe is simple, easy-to-follow, and yields 10 lovely biscuits. If you have missed enjoying the pre-dinner biscuits at Red Lobster, then you will absolutely love this exciting gluten-free replacement. Serve alongside your favorite gluten-free foods to make your next meal an outstanding one. Serving as a delightful and traditional biscuit, this gluten-free recipe won’t disappoint. With seven wholesome ingredients, and minimal time spent in the kitchen, making these biscuits is a delight. The flour used for these biscuits is a gluten-free flour blend, made with a variety of flours and other dry ingredients. The finished product is a sturdy gluten-free base for a wide variety of toppings. Try adding your favorite jam, lemon curd, a savory spread, gravy, or even your favorite brand of honey. The texture of the layers and flavor make them a wonderful option for any meal. It can be a challenge to add an adequate amount of vegetables in to your weekly meal plan. This recipe makes it possible to enjoy your favorite biscuits while eating a generous serving of vegetables at the same time. Although they still contain flour, two cups of shredded yellow squash is used in the biscuits dough, adding a healthy boost of vegetables. The squash also creates an extra layer of texture, helping differentiate these biscuits from the rest. This recipe helps achieve a balance between eating healthy and enjoying the cheesy goodness of cheddar biscuits. Serving as more of a breakfast or dessert biscuit, these butternut squash and almond biscuits are a fantastic gluten-free treat. They are dense and do not rise much, and actually do not look like a traditional biscuit. While these biscuits can be used with sweet toppings, they can also be used with savory flavors. In addition to the fabulous taste of these butternut squash and almond biscuits, they are wonderfully healthy and packed with vitamins and minerals. Ingredients such as flax, squash, almond flour, and apple cider vinegar add a tremendous amount of nutrients. The wholesome ingredients used to make these easy breakfast biscuits will help you get an excellent start to the day. Coconut flour, flaxseed meal, and Celtic sea salt are a few of the nutritious foods used to construct the breakfast biscuits. Making these breakfast treats is a simple process. If you start to read the measurements on the ingredient list, you will notice that amounts used are very small. The reason for this is that this recipe yields one single biscuit. Next time you need a quick and healthy breakfast, this recipe is a wonderful fit. Ready to try your new favorite breakfast treat? These cinnamon roll biscuits are an irresistible find. Top-quality, flavorful ingredients (such as honey, pecans, cinnamon, and more) are used for all elements of this biscuit. Before making this recipe, be aware that it is far more involved than a standard biscuit recipe. Although it may say that this is a cinnamon roll biscuit, the process is more like making a standard cinnamon roll. The extra time and effort of this recipe is completely worth it. The finished cinnamon roll biscuits are a sweet and delicious delicacy. Around the holidays, it is easy to get frazzled when trying to develop an impressive menu. There are so many recipes available online, and it be a challenge to know what your guests will like. As an added source of stress, you may also need to customize the holiday meal to fit various diets. Made with gluten-free ingredients, vegetable pot pies topped with sweet potato biscuits are an all-in-one meal. Next time you find yourself in the dilemma of what to serve your guests, be sure to use this marvelous recipe. Those who prefer a traditional biscuit that has defined, flaky layers will be delighted by this gluten-free recipe. As with most biscuit recipes, the preparation is not too complex, making it a great choice for those who prefer easy recipes. The finished biscuits are unique compared to biscuits produced by other gluten-free biscuit recipes. Rather than being fluffy and dense, these are light and have crispy layers. When looking for a biscuit that most closely resembles a biscuit that is not gluten-free, this is one of the best biscuit recipes you will be able to find. If your favorite type of traditional biscuit is the kind that melts in your mouth, this is an excellent recipe for you to try. The completed biscuits made from this recipe are exactly like the classic biscuits served alongside your breakfast at restaurants. However, with this recipe, those on a gluten-free diet can actually consume these biscuits. All ingredients used to make these treats are almost identical to other recipes, with one difference. One cup of kefir is used in the mixture, adding a unique twist. Buttermilk can be used in place of kefir if desired. Those who like an added burst of flavor in their cheesy biscuits will love this recipe for gluten-free cheesy onion biscuits. These delicacies are quick to make (approximately 30 minutes total of prep work and baking). Substitutions can be made with the ingredient list to make the biscuits dairy-free. To give the biscuits the onion taste, green onions are chopped and mixed in to the dough. Fresh or dried parsley is added to create an in-depth flavor profile. If you love cheese biscuits but want a little something extra, this is your next go-to recipe. To add yet another more traditional gluten-free and grain-free option, these easy grain-free biscuits are a fantastic recipe to try. As stated in the name of the recipe, these biscuits are wonderfully easy to make. With only seven ingredients, grain-free biscuits do not get much less complicated than they are in this recipe. Almond, coconut, and tapioca flours comprise the blend of gluten-free flours. It is this combination that helps give these biscuits an unbeatable texture. The preparation time and baking time is minimal, making this a great recipe to use if you need biscuits quickly. Making baked goods completely from scratch is a rewarding activity. Being able to say that you made something with no pre-made ingredients is exciting. However, there are times when a lack of energy, time, or both prevents you from making something from scratch. This is the time when pre-made products are a necessity. Bob’s Red Mill is a brand that makes exceptional pre-made mixes for baking. Using the Bob’s Red Mill Gluten-Free Biscuit and Baking mix is a great option for homemade biscuits. The directions are easy-to-follow, and the taste and texture are stunning. For those who are a little more adventurous in the kitchen, this gluten-free orange biscuit recipe is a fun challenge. The recipe is fairly involved, but for good reason. The finished biscuit is a work of art, and has incredible flavor and texture. When you have decided to make this recipe, plan to allow for enough time to thoroughly read through the instructions, and for prep and bake time. Enjoy this delectable delicacy as a luxurious breakfast or dessert. The biscuits would even make an impressive item to serve at a dinner party or family gathering. This gluten-free biscuit recipe produces another wonderful version of a traditional-style biscuit. These biscuits are designed to rise less and to be a little more flat that the average biscuit. Even though the biscuits do not rise much, the texture is still delightfully soft and fluffy. Another interesting aspect of this biscuit recipe is that it only requires five ingredients (almond flour, baking powder, Himalayan salt, coconut oil, and egg whites). All ingredients are both gluten-free and dairy-free. Each batch yields approximately five tasty biscuits, and they take under a half an hour to prepare and bake. As the last traditional biscuit recipe on this list of the 50 of the most incredible gluten-free biscuit recipes, these biscuits are certainly not least in quality. Beautiful, flaky layers are revealed down the side of each glorious biscuit. Because this is a classic biscuit recipe, the possibilities are endless in the toppings you can add to each one. Sweet and savory toppings alike help bring out all the incredible qualities of this biscuit. As with other traditional biscuits, honey, nearly all varieties of jam, or any other favorite gluten-free spread serves as a beautiful pairing. Nearly all gluten-free buttermilk biscuit recipes have slight variances between one another. Both the ingredients and techniques used help determine all aspects of how the biscuit develops. Will the biscuits be soft and moist, or hard and brittle? How much will they rise? This recipe uses highly specific ingredient ratios and techniques, leading to an incredible gluten-free buttermilk biscuit. These biscuits rise quite a bit, and have a gorgeous golden color on top. The exterior is perfectly crisp, and the inside is soft and moist. It is yet another fantastic, easy recipe to try and enjoy. Adding an appetizing burst of flavor to a standard biscuit, these gluten-free bacon and cheddar savory biscuits are fantastic. Bacon, sharp cheddar cheese, and scallions are the flavorful stars in this recipe. Prep and bake time combined can take around an hour, and the recipe yields between six and eight biscuits. If you normally serve a traditional-style biscuit at the dinner table, mix up your routine by serving these tasty treats. These biscuits would also make an exciting addition to your next brunch, or served as a gluten-free appetizer at an upcoming gathering. The final biscuit on the list of 50 of the most incredible gluten-free biscuit recipes is a buttermilk biscuit. This version of a standard buttermilk biscuit recipe is perfection. From the slightly crisp exterior, to the cloud-like inside, this recipe gets everything right. Because it so closely mimics the taste and texture of a regular buttermilk biscuit, it is impossible to know that these biscuits are gluten-free. There are no obvious signs that this is anything other than a standard biscuit. This recipe takes 30 minutes to prep and bake, and the yield is 8-10 biscuits. The world of gluten-free baked goods has changed immeasurably over the past few decades, and so many wonderful options are now available to those on a gluten-free diet. Rather than having recipes for a few average biscuits, this list demonstrates the range of gluten-free options that are now available. From a traditional buttermilk biscuit, to cheddar biscuits, to the most creative biscuit recipes that can be imagined, there is something for everyone. Additionally, many of these recipes are customized to fit more than one dietary need. Many of the gluten-free biscuit recipes also fit paleo, vegan, and soy-free diets. Now that you have reviewed 50 of the most incredible gluten-free biscuit recipes, it is time to start trying your favorites from the list. Start experimenting with the recipes that sound most interesting to you, and feel free to add your own twist to the recipes as well. If something doesn’t turn out perfectly the first time, keep trying and learn how to make each recipe to fit your preferences. No matter what you do, have fun when making your favorite gluten-free recipes.